This hearty crumble comes together quickly and is perfect for a cozy weekend breakfast. We relied on fruit and organic coconut sugar to keep blood sugar levels from spiking and the extra 18 grams of protein help you stay full through a busy morning. 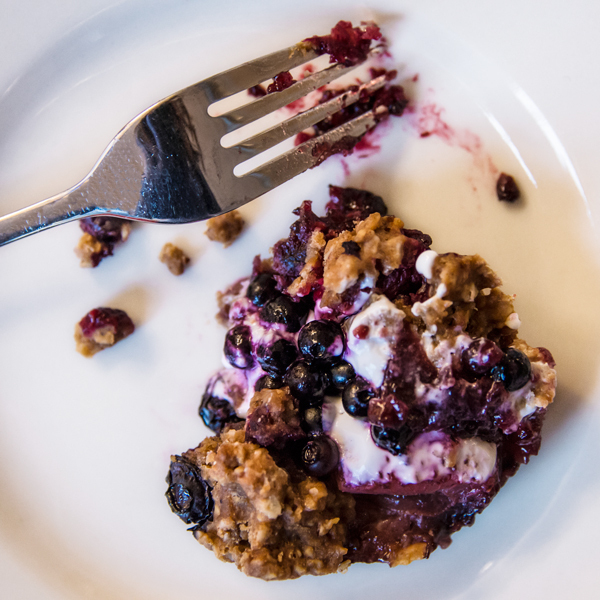 We love the hot-cold combination of this crumble when paired with yogurt or simply as a snack on it’s own. In a bowl, stir together the maple syrup, arrowroot, vanilla, and lemon/orange juice. Carefully mix in the seasonal berries. Let sit. In another bowl, combine oatmeal, oat flour, coconut sugar, baking powder, salt, and ALOHA Daily Good. Stir in coconut oil and applesauce. Dough should be crumbly. Divide dough in half and press one half onto bottom of pan. Gently place berry mixture evenly over the crust. Crumble remaining mixture of dough over the berry mixture. Bake in oven for 40 minutes or until top crumbled pieces are slightly brown. Cool for approximately 20 minutes and serve.